Okay, tomorrow is the big day, when the next issue of the Erie Reader comes out, etc & co. In the meantime, what about today? Well, for starters, there's Scooby Doo and monsters. I saw this post by Chris Sims on Comics Alliance about his preference for monsters in Scooby Doo not being real -- that is, ordinary people dressed up as monsters -- and it neatly mirrored my sentiments when I saw some of the later Scooby Doo movies my kids love, in which there are actual monsters and ghosts. I will fight tooth and nail over the idea that there should never, ever be even a trace of the supernatural in the world of Scooby-Doo. And as far as I'm concerned it's not a matter of preference, either -- it's so deeply ingrained into the premise of the show and the way the characters interact that if actual monsters do show up, the whole thing collapses. 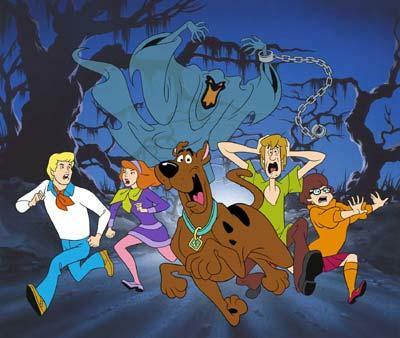 The very first rule of Scooby-Doo, the single premise that sits at the heart of their adventures, is that the world is full of grown-ups who lie to kids, and that it's up to those kids to figure out what those lies are and call them on it, even if there are other adults who believe those lies with every fiber of their being. And the way that you win isn't through supernatural powers, or even through fighting. The way that you win is by doing the most dangerous thing that any person being lied to by someone in power can do: You think. Not only that, but the bad guys, according to Sims, "prey on superstition, because that's the one thing that an otherwise rational person doesn't really think through." To defeat the bad guys, the Mystery, Inc. Gang uses reason. By making the monsters real, you change the premise of that message. I have to agree. Scooby Doo -- or the original -- was about defeating people in power who used superstition to intimidate people at large with reason. And, as Sims said, that's what makes Scooby Doo such a great show, even after all this time.